Book reviews, bibliotherapy, a cup of tea, and a passion for the written word! Well, exams are officially over and I have emerged with mind relatively intact. Regular posting schedule now to resume, with a small backlog of book reviews to work my way through. But more of that later (once I have had a proper night’s sleep and feel able to communicate in a somewhat coherent way). For now, I leave you with a slightly delayed Monday Musing – an offering from one of the authors I am currently enjoying and a celebration of the occupation that will once again dominate my life. See you all tomorrow for an update in the form of What I’m Reading Wednesday – and not a textbook in sight! My name is Laura and I am a book addict. 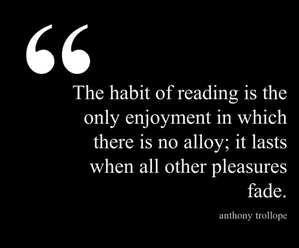 The Book Habit is a chronicle of my literary adventures, indulging my decades-long love affair with the written word. Here I post reviews, as well as anything else related to the literary lifestyle. Enter your email address to follow The Book Habit and receive notifications of new posts by email.